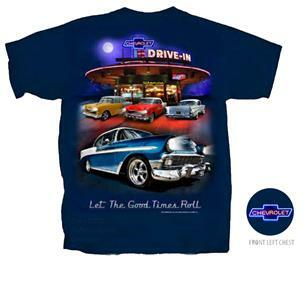 The "Chevrolet Nighttime Drive-In" t-shirt features a large image on the back of four Bel Airs outside a drive-in restaurant at night, with the legend "Let The Good Times Roll". There is a small "Chevrolet" neon logo on the left breast. 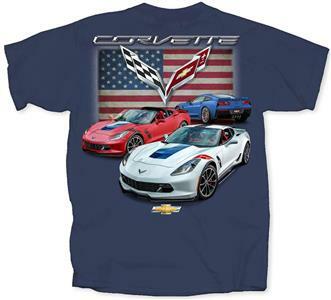 This is all printed on a high quality, pre-shrunk 100% cotton shirt in midnight blue.